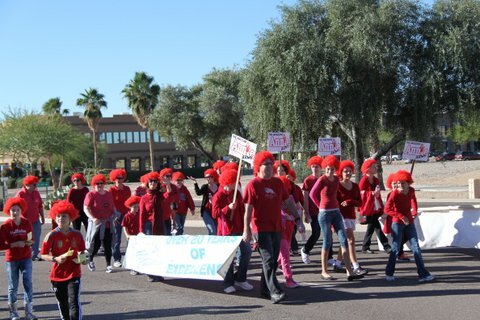 There’s Nothing Like a Parade And Fountain Hills Thanksgiving Parade Tops the Chart! Avenue of the Fountains & Saguaro Boulevard; Thanksgiving Day, November 26, 2015. 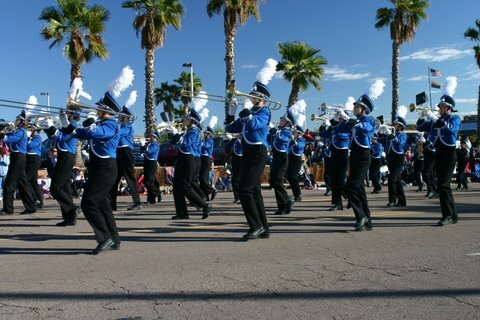 9-10:30 a.m.
For 31 years, the Fountain Hills Chamber of Commerce has sponsored the largest Thanksgiving Day parade in the Southwest. This heart-warming tradition is an action-packed 90 minutes of kids, and cars and horses and of course, marching bands. Several thousand Arizonans and winter visitors from across the Valley bring their chairs, hot chocolate and maybe blanket and line both sides of Palisades and north Saguaro Boulevard. For many families, it has become an annual tradition, and a great way to pass the time while the turkey is home getting a tan. School and Community groups will join local business to create floats showcasing their interpretation of this year’s theme, ‘Rockin Rodolph.’ Precision performance and dance groups, Scout troops, the VFW, Shriners and a number of equestrians add to the excitement. Thousands of pounds of candy and treats are tossed to the kids lining the street, rivaling Halloween for a pre-Thanksgiving sugar high. From Dental health to Dent repair, local businesses create floats to highlight their specialties and celebrate their commitment to our community. The Falcon Band and Spirit troupe is always a thrill to experience up close, enjoying the precision and pride they bring to their performance. 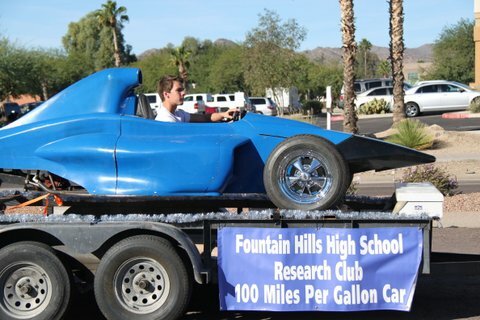 Several floats are produced by our local schools, including each year’s award-winning ‘100 Mile per gallon’ cars from our Science and Engineering classes at the High School. The Youth Theater troupe is always a treat, as put a dramatic tweak to the promotion of their Holiday season shows. Chamber of Commerce volunteers manage the Parade, including registration, the parade narration stations, and judging for a wide series of awards. This popular Parade is one of so many ways the Chamber-sponsored public events enhance our unique quality of life in Fountain Hills. This entry was posted in Area Events, Arts, Culture, Schools & Clubs and tagged Fountain Hills Turkey Trot, Thanksgiving Day Parade. Bookmark the permalink.